Damn, I’m cheap, and I want to start some seedlings for my garden. What to do, what to do? I should get one of those newspaper pot roller things. They’re great. I’m reusing old newspaper and I don’t have to transplant them. Plus all those damn plastic trays I bought last year didn’t hold up to the cat and dog laying on top of them, so I’m gonna have to do something for that anyway. That thought process led me to getting an awesome little tool and losing about three hours of my life to making paper pots. If you have read the rest of this blog you're going to know that I am not that big on measuring things, so it should come as no surprise when I tell you that I had no ruler and no idea of how long 3.5" actually was. So the first thing I did was cut my newspapers into fourths. Okay, I lied. 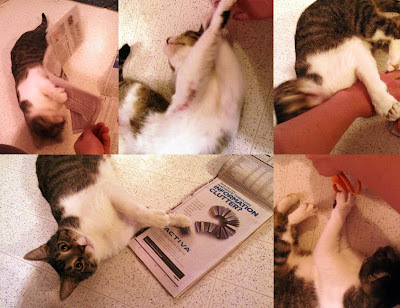 The first thing I did was wrestle the newspaper away from my cat and manage to miraculously not cut his feet off while I was trying to cut my newspaper. Such. A. Bad. Kitty. Seriously, if cats could take Adderall he would be on it. Anyway, my lovely method of measuring yielded newspaper that was way too wide. Go figure. So rather than cutting it again I took the lazy way out and folded it. 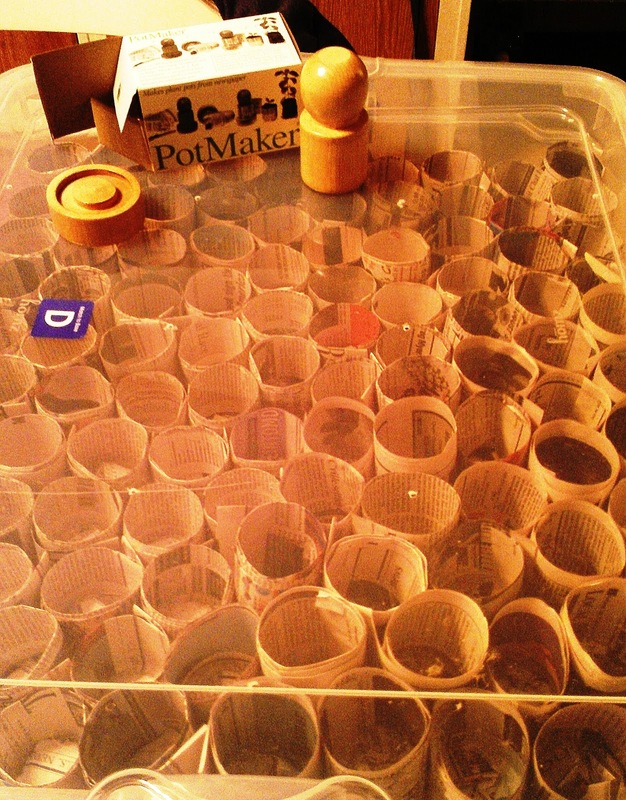 Wanna see how the cool little pot maker thing works? Yes? Awesome. Because I made you a montage. I hope you like it. Quick! Go play Eye of the Tiger while you look at it! Pretty sweet, yeah? I thought so too until I had to fill this. This being a big clear plastic tub that I had to buy and drill air holes in to protect all of my newly made pots, because someone, not going to mention any names *cough*MyGodDamnCats*cough, cough* decided to destroy all of them last time. Lets see them crush and shred them now! Yeah! You might need to put it on loop for effect. That is three hours of Survivor right there.